Chicago, welcome to the club! Along with NYC, Los Angeles, Philly, Montreal, Boston, and Orlando, you too now have your very own kosher food truck! Milt’s Barbecue for the Perplexed, one of the most popular kosher restaurants in the country, will be going curb-side starting mid August 2014! 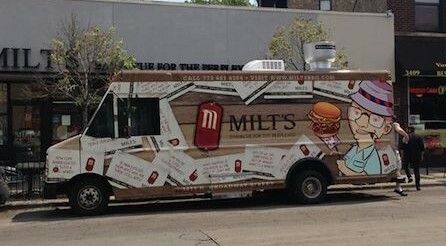 Milt’s food truck will serve sandwiches from their restaurant’s menu, including brisket, pulled chicken, burgers and hot dogs. Also expect appetizers including wings (smoked or Buffalo), sides, and of course–barbecue! The truck is under the same supervision as the restaurant: CRC.